A range of custom analysis offerings is also available to organizations providing specific data and resources. Flood layers are available for viewing in Google Earth. Download a KML file and open with Google Earth to explore 1-10 ft water levels. This embedded map inherits the position and data layers from the big version. If you'd like it to show another data layer, or a different place, just close this and change the big version to how you want it, then hit EMBED THIS MAP again. Climate Central’s Surging Seas: Risk Zone map shows areas vulnerable to near-term flooding from different combinations of sea level rise, storm surge, tides, and tsunamis, or to permanent submersion by long-term sea level rise. Within the U.S., it incorporates the latest, high-resolution, high-accuracy lidar elevation data supplied by NOAA (exceptions: see Sources), displays points of interest, and contains layers displaying social vulnerability, population density, and property value. Outside the U.S., it utilizes satellite-based elevation data from NASA in some locations, and Climate Central’s more accurate CoastalDEM in others (see Methods and Qualifiers). It provides the ability to search by location name or postal code. 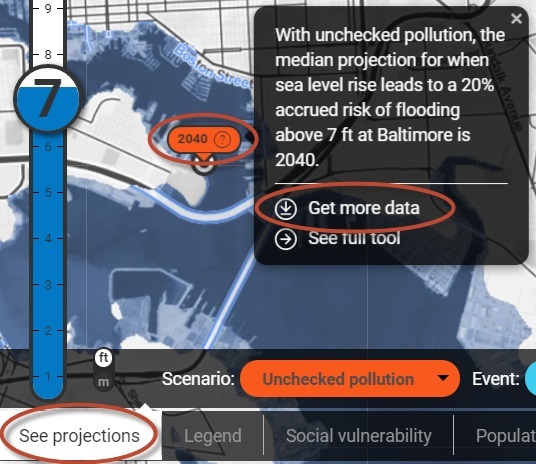 The accompanying Risk Finder is an interactive data toolkit available for some countries that provides local projections and assessments of exposure to sea level rise and coastal flooding tabulated for many sub-national districts, down to cities and postal codes in the U.S. Exposure assessments always include land and population, and in the U.S. extend to over 100 demographic, economic, infrastructure and environmental variables using data drawn mainly from federal sources, including NOAA, USGS, FEMA, DOT, DOE, DOI, EPA, FCC and the Census. This web tool was highlighted at the launch of The White House's Climate Data Initiative in March 2014. Climate Central's original Surging Seas was featured on NBC, CBS, and PBS U.S. national news, the cover of The New York Times, in hundreds of other stories, and in testimony for the U.S. Senate. The Atlantic Cities named it the most important map of 2012. Both the Risk Zone map and the Risk Finder are grounded in peer-reviewed science. This map is based on analysis of digital elevation models mosaicked together for near-total coverage of the global coast. Details and sources for U.S. and international data are below. Elevations are transformed so they are expressed relative to local high tide lines (Mean Higher High Water, or MHHW). A simple elevation threshold-based “bathtub method” is then applied to determine areas below different water levels, relative to MHHW. Within the U.S., areas below the selected water level but apparently not connected to the ocean at that level are shown in a stippled green (as opposed to solid blue) on the map. Outside the U.S., due to data quality issues and data limitations, all areas below the selected level are shown as solid blue, unless separated from the ocean by a ridge at least 20 meters (66 feet) above MHHW, in which case they are shown as not affected (no blue). Elevation data used for parts of this map within the U.S. come almost entirely from ~5-meter horizontal resolution digital elevation models curated and distributed by NOAA in its Coastal Lidar collection, derived from high-accuracy laser-rangefinding measurements. The same data are used in NOAA’s Sea Level Rise Viewer. (High-resolution elevation data for Louisiana, southeast Virginia, and limited other areas comes from the U.S. Geological Survey (USGS)). Areas using CoastalDEM™ elevation data: Antigua and Barbuda, Barbados, Corn Island (Nicaragua), Dominica, Dominican Republic, Grenada, Guyana, Haiti, Jamaica, Saint Kitts and Nevis, Saint Lucia, Saint Vincent and the Grenadines, San Blas (Panama), Suriname, The Bahamas, Trinidad and Tobago. CoastalDEM™ is a proprietary high-accuracy bare earth elevation dataset developed especially for low-lying coastal areas by Climate Central. Use our contact form to request more information. Areas of this map not listed above use elevation data on a roughly 90-meter horizontal resolution grid derived from NASA’s Shuttle Radar Topography Mission (SRTM). SRTM provides surface elevations, not bare earth elevations, causing it to commonly overestimate elevations, especially in areas with dense and tall buildings or vegetation. Therefore, the map under-portrays areas that could be submerged at each water level, and exposure is greater than shown (Kulp and Strauss, 2016). However, SRTM includes error in both directions, so some areas showing exposure may not be at risk. SRTM data do not cover latitudes farther north than 60 degrees or farther south than 56 degrees, meaning that sparsely populated parts of Arctic Circle nations are not mapped here, and may show visual artifacts. Areas of this map in Alaska use elevation data on a roughly 60-meter horizontal resolution grid supplied by the U.S. Geological Survey (USGS). This data is referenced to a vertical reference frame from 1929, based on historic sea levels, and with no established conversion to modern reference frames. The data also do not take into account subsequent land uplift and subsidence, widespread in the state. As a consequence, low confidence should be placed in Alaska map portions. Levees, walls, dams or other features may protect some areas, especially at lower elevations. Levees and other flood control structures are included in this map within but not outside of the U.S., due to poor and missing data. Within the U.S., data limitations, such as an incomplete inventory of levees, and a lack of levee height data, still make assessing protection difficult. For this map, levees are assumed high and strong enough for flood protection. However, it is important to note that only 8% of monitored levees in the U.S. are rated in “Acceptable” condition (ASCE). Also note that the map implicitly includes unmapped levees and their heights, if broad enough to be effectively captured directly by the elevation data. For more information on how Surging Seas incorporates levees and elevation data in Louisiana, view our Louisiana levees and DEMs methods PDF. For more information on how Surging Seas incorporates dams in Massachusetts, view the Surging Seas column of the web tools comparison matrix for Massachusetts. Errors or omissions in elevation or levee data may lead to areas being misclassified. Furthermore, this analysis does not account for future erosion, marsh migration, or construction. As is general best practice, local detail should be verified with a site visit. Sites located in zones below a given water level may or may not be subject to flooding at that level, and sites shown as isolated may or may not be be so. Areas may be connected to water via porous bedrock geology, and also may also be connected via channels, holes, or passages for drainage that the elevation data fails to or cannot pick up. In addition, sea level rise may cause problems even in isolated low zones during rainstorms by inhibiting drainage. At any water height, there will be isolated, low-lying areas whose elevation falls below the water level, but are protected from coastal flooding by either man-made flood control structures (such as levees), or the natural topography of the surrounding land. In areas using lidar-based elevation data or CoastalDEM (see above), elevation data is accurate enough that non-connected areas can be clearly identified and treated separately in analysis (these areas are colored green on the map). In the U.S., levee data are complete enough to factor levees into determining connectivity as well. However, in other areas, elevation data is much less accurate, and noisy error often produces “speckled” artifacts in the flood maps, commonly in areas that should show complete inundation. Removing non-connected areas in these places could greatly underestimate the potential for flood exposure. For this reason, in these regions, the only areas removed from the map and excluded from analysis are separated from the ocean by a ridge of at least 20 meters (66 feet) above the local high tide line, according to the data, so coastal flooding would almost certainly be impossible (e.g., the Caspian Sea region). Water level means feet or meters above the local high tide line (“Mean Higher High Water”) instead of standard elevation. Methods described above explain how each map is generated based on a selected water level. Water can reach different levels in different time frames through combinations of sea level rise, tide and storm surge. Tide gauges shown on the map show related projections (see just below). The highest water levels on this map (10, 20 and 30 meters) provide reference points for possible flood risk from tsunamis, in regions prone to them. Scientists agree that climate change has been driving a rise in global sea level, and the rise will accelerate, leading to ocean intrusion on land and aggravated coastal flood risk. Over 1,000 global tide gauges shown on the map, illustrated by bulls-eyes, give downloadable local projections for sea level rise through the year 2200, based on two recent peer-reviewed research papers (Kopp et al. 2014; Kopp et al. 2017) building off of global projections from the IPCC and, in the latter case, new research on the potential instability of Antarctic ice sheets (DeConto and Pollard 2016). Select tide gauges within the U.S. where at least 30 years of hourly water level data are available also give flood risk projections which integrate sea level rise, based on methods described in other research (Tebaldi et al. 2012; Buchanan et al. 2016). Outside the U.S., flood risk forecasts are based upon integrating sea level projections with flood risk statistics from the Global Tide and Surge Reanalysis (Muis et al. 2016). In all cases, users may select from among different carbon pollution scenarios, including “unchecked pollution” (technically, Representative Concentration Pathway 8.5, or RCP 8.5), “moderate carbon cuts” (RCP 4.5), and “extreme carbon cuts” (RCP 2.6), this last choice meaning a peak in emissions near the year 2020 followed by a sharp decline to zero near 2070. For gauges with flood risk projections, users may choose between viewing accrued risk (i.e. what is the multi-year risk of flooding between the present and a future year) or annual risk (i.e. what is the single-year risk of flooding within the indicated future year). Below water level: Areas below water level, and connected to the ocean. Below but isolated: Areas below water level, but not connected to the ocean, due to natural or built breaks such as levees. This type of area is separately identified only within the U.S., where higher quality elevation data and the availability of levee data allow greater confidence in the assessment of connectivity. See Methods for more detail. Levees: Built flood control structures including dams, gates and surge barriers as well as levees. Tide gauges: Locations with long-term water level records sufficient for making localized sea level projections and, in cases, flood risk projections. Census block group resolution data. Based mostly on assessed values in 2008, adjusted to 2012 dollars. Data sources: U.S. Environmental Protection Agency, Neumann et al 2011. See Data Layers, above, for most sources. Others follow. U.S. elevation data: National Oceanic and Atmospheric Administration (NOAA), U.S. Geological Survey (USGS) (for Louisiana, southeast Virginia, Alaska, and limited other areas). Global elevation data: NASA and Climate Central. Global sea surface height data (1993-2009): Aviso. U.S. tidal elevation data: NOAA. Global tidal elevation data: courtesy of Mark Merrifield, University of Hawaii. Global flood risk parameters: courtesy of Sanne Muis, Vrije Universiteit Amsterdam (see Muis et al. 2016). Learn about Climate Central’s portfolio analytics, global coastal elevation data, custom analysis and tool-building for clients with more specialized needs. The Climate Central sea level rise group conceived and maintains this tool. Please consider supporting our nonprofit efforts. To the many organizations that have financially supported Climate Central and its sea level program, including The Schmidt Family Foundation, The Kresge Foundation, The Rockefeller Foundation, Island Foundation, and others. Map development was also supported in part by U.S. National Science Foundation grant ARC-1203415, and by the Raising Risk Awareness (RRA) project. RRA is funded by the UK Department for International Development (DFID) through the Climate and Development Knowledge Network (CDKN), and by Eric and Wendy Schmidt through Climate Central, Inc. CDKN is a programme funded by DFID and the Netherlands Directorate-General for International Cooperation (DGIS) for the benefit of developing countries. To NOAA's Office for Coastal Management, which has provided high-accuracy coastal elevation data, consistent courtesy, and leadership with its Sea Level Rise Viewer, a map tool Surging Seas strives to complement. To our project partner for U.S. social vulnerability analysis, the University of South Carolina Hazards and Vulnerability Research Institute. Map designed and built in collaboration with Stamen Design in San Francisco. Hospital icon used to represent Hospitals designed by Saman Bemel-Benrud from The Noun Project. Badge icon used to represent Fire/EMS/Police stations designed by Edward Boatman from The Noun Project. School icon used to represent Schools/Colleges designed by Saman Bemel-Benrud from The Noun Project. Prayer icon used to represent Houses of Worship was designed by Carson Wittenberg from The Noun Project. Museum icon used to represent Culture/Museums/Arts designed by Unknown Designer from The Noun Project. Government Office icon used to represent Government/Community designed by OCHA AVMU from The Noun Project. Power Plant icon used to represent Powerplants designed by Iconathon with Collaboration by Chad Williamsen, Katie Williamsen, Alison Harshbarger & John Durkee from The Noun Project. Caution icon used to represent EPA-Listed Sites designed by Sam Ahmed from The Noun Project. Climate Central’s Surging Seas: Risk Zone map shows areas vulnerable to near-term flooding from different combinations of sea level rise, storm surge, tides, and tsunamis, or to permanent submersion by long-term sea level rise. Within the U.S., it incorporates the latest, high-resolution, high-accuracy lidar elevation data supplied by NOAA (exceptions: see Sources), displays points of interest, and contains layers displaying social vulnerability, population density, and property value. Outside the U.S., it utilizes satellite-based elevation data from NASA. It provides the ability to search by location name or postal code. Areas of this map outside the U.S. use elevation data on a roughly 90-meter horizontal resolution grid derived from NASA’s Shuttle Radar Topography Mission (SRTM). SRTM provides surface elevations, not bare earth elevations, causing it to commonly overestimate elevations, especially in areas with dense and tall buildings or vegetation. Therefore, the map under-portrays areas that could be submerged at each water level, and exposure is greater than shown (Kulp and Strauss, 2016). However, SRTM includes error in both directions, so some areas showing exposure may not be at risk. At any water height, there will be isolated, low-lying areas whose elevation falls below the water level, but are protected from coastal flooding by either man-made flood control structures (such as levees), or the natural topography of the surrounding land. In the U.S., elevation data is detailed enough, and levee data complete enough, that non-connected areas can be clearly identified and treated separately in analysis (these areas are colored green on the map). However, outside of the U.S., elevation data is much less accurate, and noisy error often produces “speckled” artifacts in the flood maps, commonly in areas that should show complete inundation. Removing non-connected areas in these places could greatly underestimate the potential for flood exposure. For this reason, outside of the U.S., the only areas removed from the map and excluded from analysis are separated from the ocean by a ridge of at least 20 meters (66 feet) above the local high tide line, according to the data, so coastal flooding would almost certainly be impossible (e.g., the Caspian Sea region). Scientists agree that climate change has been driving a rise in global sea level, and the rise will accelerate, leading to ocean intrusion on land and aggravated coastal flood risk. Over 1,000 global tide gauges shown on the map, illustrated by bulls-eyes, give downloadable local projections for sea level rise through the year 2200, based on recent peer-reviewed research (Kopp et al. 2014) building off of global projections from the IPCC. Select tide gauges within the U.S. where at least 30 years of hourly water level data are available also give flood risk projections which integrate sea level rise, based on methods described in more recent research (Tebaldi et al. 2012; Buchanan et al. 2016). Outside the U.S., flood risk forecasts are based upon integrating sea level projections with flood risk statistics from the Global Tide and Surge Reanalysis (Muis et al. 2016). In all cases, users may select from among different carbon pollution scenarios, including “unchecked pollution” (technically, Representative Concentration Pathway 8.5, or RCP 8.5), “moderate carbon cuts” (RCP 4.5), and “extreme carbon cuts” (RCP 2.6), this last choice meaning a peak in emissions near the year 2020 followed by a sharp decline to zero near 2070. For gauges with flood risk projections, users may choose between viewing accrued risk (i.e. what is the multi-year risk of flooding between the present and a future year) or annual risk (i.e. what is the single-year risk of flooding within the indicated future year). U.S. elevation data: National Oceanic and Atmospheric Administration (NOAA), U.S. Geological Survey (USGS) (for Louisiana, southeast Virginia, Alaska, and limited other areas). Global elevation data: NASA. Learn about Climate Central’s custom analysis and tool-building for clients with more specialized needs. Your data download will begin in a moment. PowerPoint and PNG images are taken using your browser's current view. Adjust your location and window size to get a different image. Global flood layers are available for viewing in Google Earth. Download a KML file and open with Google Earth to explore. Form submitted. Your download will begin momentarily. Climate Central now offers analysis products for decision-makers who have more specific needs. Find out how coastal flood risk events may have an effect on your facilities and investments. We quantify the increasing chances of coastal flood events for organizations in the public and private sectors. Note: We do not provide analysis on individual homes at this time. Thank you for completing this form to get your free materials, which we welcome you to use and share broadly! Your answers will help us to understand our audience and improve our offerings, and we will respect your privacy. (See privacy and permissions policies below.) All fields are optional. Climate Central is a donor-supported not-for-profit organization dedicated to providing a wide range of free and accessible analyses and maps to the public. We also provide analysis products for private sector and government decision-makers who have more specific needs. Learn more.